Opening night of the 2017 NBA season was marred by a gruesome left ankle injury to Boston Celtics’ forward Gordon Hayward only five minutes into the game. While jumping for an alley-oop, the 27 year old star player landed awkwardly on his left leg, suffering an ankle fracture-dislocation. The ankle was re-set on the court, splinted, and surgically stabilized the next day at New England Baptist Hospital. With a dedicated team of surgeons, physical therapists, and trainers, Gordon Hayward will face a long and challenging road to recovery. Along the way he will achieve milestones by re-learning to walk, run, and – hopefully – returning to play in the NBA. 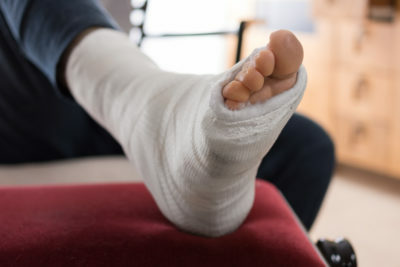 Horrific ankle injuries like this are not limited to elite professional athletes and actually occur frequently to regular people performing routine daily activities like descending stairs, mowing the lawn, climbing ladders, or simply taking a misstep around the house. A displaced ankle fracture like to Gordon Hayward’s will require surgery to re-align the bones and to fix them, typically using small plates and screws to ensure that the fracture heals in proper position. Ensuring that the bones are fixed as close to normal as possible is the most important variable affecting outcome that physicians can control. Following surgery, a progressive therapy program is critical to ensuring maximal restoration of function. Even so, rehabilitation from an injury like this can take up to a year. We wish Mr. Hayward luck as he begins the long road to recovery. Dr. Randall Marx is a board certified orthopedic surgeon, fellowship trained in conditions of the foot, ankle, and lower leg. He treats patients of all ages and is currently accepting new patients at five San Antonio area clinic locations. To schedule an appointment with Dr. Marx, please call (210) 281-9595 or visit his webpage. TSAOG podiatrist Dr. Jessica Rutstein appeared yesterday on KSAT’s SA Live to discuss the issues that can be caused by wearing ill-fitting shoes. Watch the full interview above. Ingrown Toenails – when a toenail grows into the soft flesh surrounding the nail, causing pain, redness, and swelling. Bunions – when the big toe is pushed against your second toe, often by narrow pointed shoes, causing a bony bump to form on the joint at the base of your big toe. Tailor’s Bunions – when the little toe is pressed against your fourth toe, often by narrow pointed shoes, causing a bony bump to form on the joint at the base of your little toe. Hammertoes and Mallet Toes – abnormal bends in the joints of the toes (causing a permanently curled look), caused by wearing high heels or other shoes where the toes are forced against the front of the shoe. Know your foot shape – choose a shoe not only the right size, but the right shape for your foot. A shoe with a rectangular toe box will fit most feet better than a triangular toe box. Avoid cramming your feet into a shoe that doesn’t fit comfortably. Know your arches – if you have feet with high arches or flat feet, your feet will have a tendency to roll in or out, which can cause ankle pain. Look for shoes with stabilizers to keep your feet from rolling and consider orthotics to support your arches to avoid arch pain. Know your activities – different activities (like walking vs running) require different types of foot support. Select your shoes based on what activities you plan to engage in while wearing them. Know your age – as we age, the fat padding on the bottoms of our feet tends to thin out, leaving less natural support for our feet. This is why going barefoot or wearing thin soled shoes may not be as comfortable as it once was. If you are experiencing foot or ankle pain, consider consulting a specialist to discover the cause of your pain and what you can do to correct it. Dr. Jessica Rutstein is a podiatrist with The San Antonio Orthopaedic Group. She treats patients aged 2 years and older for conditions of the foot and toes. She has a special interest in the conservative treatment of foot problems including bunions, hammertoes, warts, and heel and arch pain. To schedule an appointment with Dr. Rutstein, please call 210.281.9595 or request an appointment online. Beginning February 4th, 2015, Dr. Kevin Kirk will be seeing patients at our Medical Center location every first, third, and fifth Wednesday morning of the month. This office is located at 2829 Babcock Rd, Ste 700, San Antonio, TX 78229. Dr. Kirk treats orthopedic conditions of the foot, ankle, lower leg, and knee for patients aged 6 years and older and has a special interest in total ankle replacement, ankle and knee arthroscopy, reconstruction, and trauma surgery. In addition to the Medical Center office, Dr. Kirk continue to see patients at TSAOG’s Downtown, Northeast, Northwest, and Southeast offices. Dr. Kevin Kirk is a board certified orthopedic surgeon, fellowship trained in foot, ankle, and lower leg care, with The San Antonio Orthopaedic Group. He treats patients aged 6 years and older for all orthopedic conditions. To schedule an appointment with Dr. Kirk, please call 210.281.9595 or request an appointment online. Orthopedic surgeon and lower extremity specialist Dr. Kevin L. Kirk co-authored a study that was featured in the October 2014 issue of Clinical Orthopaedics and Related Research, a publication of The Association of Bone and Joint Surgeons. If an 8-week integrated program would improve pain, performance, and outcomes for these patients. If the level of recovery differed for those undergoing the program more than or less than 2 years after their injury. Whether the program would reduce the number of patients considering late stage amputation. The study evaluated 84 service members who underwent 4 weeks of rehabilitation without an orthotic, followed by 4 weeks of rehabilitation with an orthotic. After 8 weeks, all subjects showed improvement in patient-reported measures as well as physical performance measures and patients improved similarly regardless of the length of time out from their injury. 41 out of 50 patients who were initially considering amputation had changed their minds by the end of the program. Read the full study. Dr. Kevin L Kirk is a board-certified orthopedic surgeon, fellowship trained in conditions of the foot, ankle, and lower extremity, with The San Antonio Orthopaedic Group. He treats patients aged 6 years and up for all orthopedic conditions, but has a special interest in conditions of the foot, ankle, and knee. To schedule an appointment with Dr. Kirk, please call 210.281.9595. Beginning October 10th, 2014, Dr. Randall Marx will be seeing patients at our Downtown location every other Friday. This office is located at 1200 Brooklyn Ave, Ste 320, San Antonio, TX 78212. Dr. Marx treats orthopedic conditions of the foot, ankle, and lower leg for patients of all ages and has a special interest in total ankle replacement, ankle arthroscopy, and tendon reconstruction. In addition to the Downtown office, Dr. Marx will continue to see patients at TSAOG’s Central, Medical Center, and North Central offices. Dr. Randall Marx is a board certified orthopedic surgeon, fellowship trained in conditions of the foot, ankle, and lower leg. He has a special interest in total ankle replacement, ankle pain, and tendon reconstruction. To schedule an appointment with Dr. Marx, please call 210.281.9595. Dr. Marvin R. Brown, board certified orthopedic surgeon and foot & ankle specialist with The San Antonio Orthopaedic Group, was featured last night on KSAT News in a story about total ankle replacement. He discusses the procedure for INBONE total ankle replacement along with ankle replacement patient Bettye Dube. Ankle replacement is an option for patients with severe osteoarthritis of the ankle, which usually develops following injury to the ankle joint. If you have persistent ankle pain that is interfering with your daily life, the foot & ankle specialists at TSAOG can help. Not everyone will be a candidate for total ankle replacement, but there are a multitude of options available to alleviate joint pain. To learn more about total ankle replacement, visit our Ankle Replacement Webpage. Dr. Marvin R. Brown is a board certified orthopedic surgeon, fellowship trained in conditions of the foot, ankle, & lower leg, with The San Antonio Orthopaedic Group. He treats patients of all ages and has a special interest in total ankle replacement and deformity correction. To schedule an appointment with Dr. Brown, please call 210.281.9595.